ADJ is pleased to announce the immediate availability of the latest addition to the company’s Entour range of professional effect generation equipment. 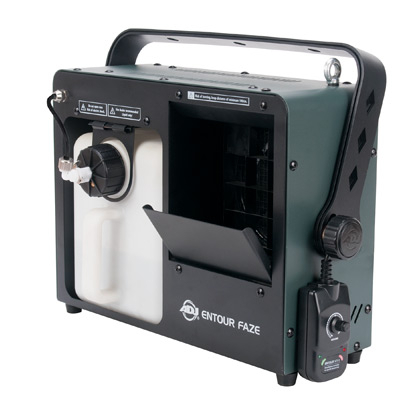 The Entour Faze is a robust and affordable portable faze machine, with patent pending rapid heater technology, that creates a thin mist of atmospheric haze using regular water-based fog fluid. It is ideal for installation in a wide variety of venues, including bars, lounges, clubs, entertainment centers, community theatres and churches, and is also suitable for mobile use by entertainers and production companies. 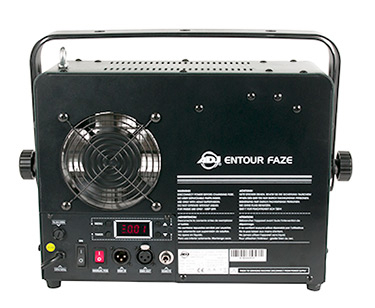 The new Entour Faze builds on the success of the popular Entourage professional touring faze machine and Entour Venue installation model, offering a more affordable and compact solution that still generates an impressive output. Combining the latest heating technology with a high-powered fan, the unit uses standard water-based fog fluid but outputs a fine mist rather than the thick plumes of smoke created by traditional fog machines. This makes it ideal for generating a lightshow-enhancing atmosphere for both stages and dancefloors. Equipped with a 450W heating element, the Entour Faze is capable of generating 1000 cubic feet of atmospheric haze per minute. It also offers a large 3-liter fluid tank and a low consumption rate of 10ml per minute, which means that it is capable of 5 hours of operation from a single tank of fluid. The unit also features ADJ’s new patent pending Rapid Heater Technology that means the machine can be ready to start producing haze just 40 seconds from the time it is turned on. For added convenience, the unit is also fitted with a useful ‘quick connect’ hose which joins the machine to the fluid tank. This allows the tank to be disconnected simply, with the push of a button, allowing for quick and easy re-filling of fluid. An automatic cut-off circuit is also fitted that protects the pump if the tank runs out of fluid. For optimal performance, only use a light formula water-based fog fluid in this fazer. ADJ recommends the F4L ECO water-based fog fluid for the Entour Faze. A flexible fixture, the Entour Faze can be operated in a number of different ways to suit a variety of applications. For simple faze generation, if offers an on/off trigger switch on its back panel that can be used to engage the effect whenever it is required. It is also supplied with a timer remote control, which connects to the main unit via a ¼” jack plug and can be used to set bursts of faze to be generated at user-determined regular intervals. Finally, the unit is also compatible with DMX control, with a choice of 1, 2 or 4-channel operation, allowing it to be controlled using any DMX control hardware or software. The machine features a unique dual hanging bracket system that can be used to hang the unit from above or serve as a variable angle floor stand. A safety eye is provided to allow the attachment of a safety wire when the unit is rigged and it is also fitted with rubber feet that allows it to operate standing directly on the floor of a stage or venue. With compact dimensions of 16.25” x 8” x 12” / 414 x 202 x 303mm (L x W x H), the Entour Faze is easily portable and will make an inconspicuous addition to any stage or dancefloor lighting rig. Weighing just 10 lbs. 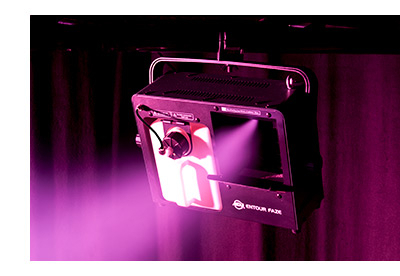 / 4.5 kg, the unit is also easy to carry and rig, making it ideal for enhancing the effects created by a mobile lightshow. The Entour Faze is available now from ADJ distributors and dealers worldwide. ADJ will be at PLASA 2018 (September 16-18), London Olympia, National Hall stand #H38, and LDI 2018 (October 19-21), Las Vegas Convention Center booth # 1117.